Fast, efficient and very easy. Much safer than old fashioned plate x-rays. The benefits of x-rays are well known. They help us diagnose common problems such as cavities, gum disease and some types of infections. X-rays allow the clinicians to see inside a tooth and beneath the gums. Without them, more disease would go unnoticed and treatment would begin later. As a result, people would have more pain and lose more teeth. At First Choice Dental Clinic our high tech digital x-rays use less radiation meaning safer x-rays. The X-ray units used in our dental clinic emit extremely small doses of radiation. However, cells can be damaged by repeated small doses of x-rays that add up over time. That's why we recommend that x-rays should be used with caution and only when necessary. The picture shows an actual x-ray image taken in the clinic of one of our patients. 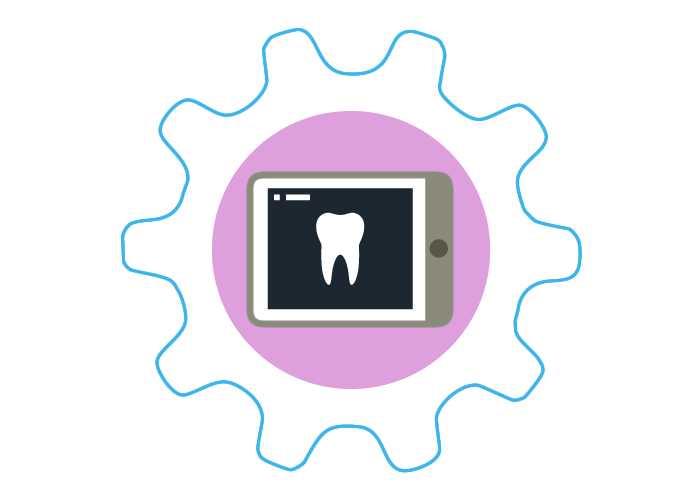 • Digital radiography - The use of digital x-rays reduces radiation by as much as 80%. • Film holders - Dental patients used to hold X-ray film in their mouths with their fingers. Those days are long gone. Now, holders keep the film perfectly positioned. • Regular inspections and licensing - Health departments regularly check x-ray machines to make sure they are accurate and safe. • Limited use of x-rays - We take x-rays only when we believe they are necessary for an accurate dental assessment or diagnosis.